This is a little off-topic, but I’ve decided to post a review of Studio Ghibli’s Kiki’s Delivery Service. I recently attended a 35mm showing of the film and was just swept away – it was almost like seeing the film again for the first time. Here’s an uncritical and overly-emotional ode to the film. Kiki’s Delivery Service remains one of the most indelibly charming films of all time. Even 24 years on, the film stands as a testament to the legendary director/screenplay writer Hayao Miyazaki’s ability to craft a breathtaking story. If the film is not better known, it is because the calibre of Studio Ghibli films are so astounding that it gets lost in a haze of excellence. It’s not as haunting as Howl’s Moving Castle, nor as fantastical as Spirited Away. It lacks the flair of Porco Rosso and the nail-biting terror of Princess Mononoke. It even fails to have an iconic big fluffy monster such as in My Neighbour Totoro, or the unnerving presence of raccoon testicles that serve as a constant reminder that you are definitely watching something Japanese that is a feature of Pom Poko. 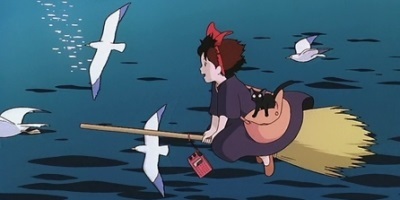 What Kiki’s Delivery Service has is something a lot less certain. I’m not even sure what it is, only that it’s an emotion that fills me with a sadly sweet nostalgia. 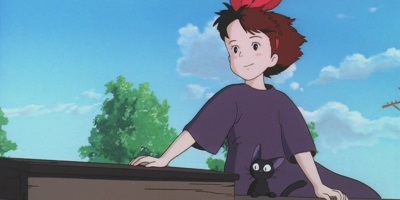 A story about a teenage witch with a black cat (yet Melissa Joan Hart is nowhere to be found) who leaves home, unable to find her place in the world seems as far removed from my own sordid life as it is possible to get, yet Kiki is the most familiar, the most sympathetic, the most identifiable of all Miyazaki’s characters. This is a beautiful film, made all the more so by watching it in the incomparable Prince Charles Cinema in London, on a 35mm roll. Real gritty, grainy film is always a treat, but seeing every hand-drawn vista in Kiki’s Delivery Service as it was meant to be seen was a remarkable experience. The vibrancy of every colour and evident care taken in drawing every line would alone make watching this film on print bring a smile to your face, but the storyline matches the beauty of the animation note for note. If this film were a Western production, it would be a film aimed at a PG audience about a girl who can fly broomsticks with a smart-talking sidekick that went to a new place, hit a low, play a Randy Newman song, hit a high, roll credits and begin production on the sequel. Thankfully, Kiki’s Delivery Service has the sensibilities and insensibilities of Miyazaki. The film instead sees an enthusiastic girl in a beguiling yet overbearing coastal city, crushed by feelings of helpless inadequacy and adolescent loneliness. She carves out a place for herself in the world, yet loses all joy in it. She makes new friends, yet quickly desires to be far apart from them for reasons she cannot explain. All the grace she had, her easy attitude, her natural talents, her optimism, seems to slip away. It is also about creativity, finding that spark to fight for the grace you lost and earn it back. 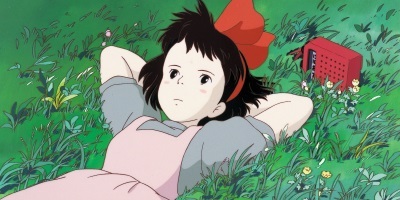 It is this internal struggle, so often mangled by cinema within the time constraints of a film, that makes Kiki feel like a real character – quirky, flawed, who often feels miserable but has no idea why and just hates herself for it, this self-centeredness only serving to further exacerbate her feelings of inadequacy. Or perhaps I’m merely projecting. The subtleties of Kiki’s development as a character is often told outright – remember, this is a children’s film after all, but for those who look for something deeper, you are rewarded with lingering expressions on Kiki’s face, strange and wistful, that seem impossible considering the relative simplicity of the drawing style. 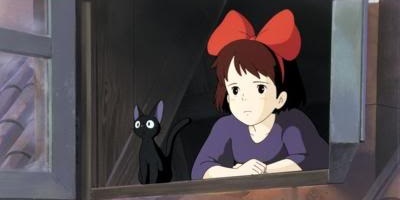 Miyazaki’s films are filled with strong, believable female characters who go up against events that could crush them should they buckle, but Kiki’s tale is altogether more quiet, more insular, and that makes her all the more fascinating. In an age of cinema where the stakes are always complete annihilation, it’s wonderful to be able to return to such an unassuming film. The greatest strength of Kiki’s Delivery Service is the warmth it conveys. It is hot chocolate rendered in celluloid. Adults cannot stop themselves being enraptured by Kiki’s self-discovery and emotional journey. Children are eagerly captivated by the colours, the blend of the magical and the mundane, the talking cat Jiji and his long-suffering looks (who incidentally feels as though he was the inspiration for the talking cat Luna in Sailor Moon). This film is of the kind that, after you see it, you want to show it to your own children, to show them what animation used to be in a time before computer rendering, in the hopes that they will achieve even the smallest glimpse into your own moving experience with Kiki. Even those who lack the biological discharges we call children, those who never even envisaged having them, will dream wistfully of the day they could sit their offspring in front of Kiki’s Delivery Service and watch their face brighten in delight and wonder. Yes, this review was schmaltzy and saturated with gooey adjectives, and yes it is tinged with a faint sense of embarrassment at having so poured my heart out about a 24 year old film intended for little girls, but dammit that’s what I do. Asides from Kiki’s Delivery Service, I can think of few films that truly deserve such unadulterated praise.